Deerfield Beach, Fla. : Health Communications, c1995. xxvi, 194 p. ; 22 cm. 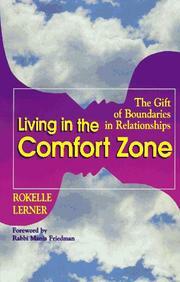 Living in the comfort zone : the gift of boundaries in relationships / Rokelle Lerner ; [foreword by Manis Friedman]. 100 ME:PersonalName 1 $a Personal name Lerner, Rokelle. $c Statement of responsibility Rokelle Lerner ; [foreword by Manis Friedman]. 504 BibliogrphyNote $a Bibliography, etc. note Includes bibliographical references (p. 189-191). 650 Subj:Topic 0 $a Topical term Self.